Welcome to the Pajama Party at Feral House! Welcome to Feral House and the second annual Pajama Party! I’m meeting you on the front stoop of Feral House, today. Careful on the brick steps! It’s a bit chilly here, overcast and cool—a typical December day in Great Falls, Virginia. The Ferals are a little uneasy about so many guests arriving when things have been so crazy. They asked that we all come in at once, so we’ll gather here for a few minutes while everyone arrives. Oh, and by the way, there are still a number of new Ferals unaccounted for. If any of you have accidentally gone feral (drawn fangs and claws) recently, now’s the time to speak up. They’re looking for you! Kim Castillo, my valiant assistant, is helping me out today. We’re giving away a ton of prizes: Ten signed books plus a Grand Prize of a $50 Amazon gift card! If you win a book, I’ll send you a signed copy of the book of your choice (Feral, Esri, or Vamp City). Just let Kim know which one when you give her your address. (All winners must send Kim (kimscastillo@gmail.com) their snail mail addresses.) If you can’t decide, I’ll surprise you. At the end of the party, we’ll be awarding the Grand Prize which will be drawn at random from everyone who posts during the two hours, including trivia winners. The full list of winners will be posted on my blog tomorrow, so be sure to check back! Follow me down to the Comments section below where everything is happening. You may have to log in the first time (just takes a second), then you’re good to go! This entry was posted in Events, The Feral Warriors on December 9, 2012 by Pamela Palmer. 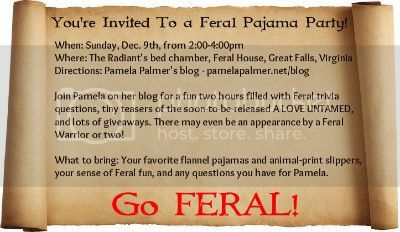 You’re Invited to a Pajama Party at Feral House! This entry was posted in Events, The Feral Warriors on November 30, 2012 by Pamela Palmer. Grab the nets! I’ve got all kinds of Feral fun for you to catch. If you love the Feral Warriors and want a never-before-seen glimpse into Lyon and Kara’s story, or if you’re new to the Ferals and want to find out more about these uber hot shape-shifters, I have news! Avon Books has just released (and only for a short while), a special version of Book 1, Desire Untamed with Bonus Material, for just 99 cents! To celebrate, I’m doing a fab giveaway of a Kindle Paperwhite over at Bitten By Books Thursday, Nov. 7th. RSVP beforehand to increase your chances of winning! Book 7 in the Feral Warriors series, A Love Untamed, will be in bookstores December 26th and by popular demand I’ll be hosting another Pajama Party at Feral House. Mark your calendars for Sunday, Dec. 9th from 2-4pm EST for two full hours of giveaways, tiny teasers from A Love Untamed, trivia questions, and the occasional appearance by a Feral Warrior or two. There’s more Feral fun over at my website: excerpts of A Love Untamed, a Fox postcard giveaway, etc. If you haven’t signed up for my Newsletter, don’t forget to do that, too, while you’re over there. It’s the easiest way for me to keep you up-to-date with what’s going on with the Feral Warriors and Vamp City. This entry was posted in Events, The Feral Warriors on November 7, 2012 by Pamela Palmer. I’ve been writing, writing, writing, finishing up the second book in the Vamp City series, A KISS OF BLOOD, which comes out next June. The romance is really starting to spark, the action is off the charts, and I’m absolutely having a blast writing Quinn and Arturo’s story. In addition, I’ve just written a Vamp City novella about a new couple, Elizabeth and Lukas, that will be coming out February 12th in the Avon Impulse anthology VAMPIRES GONE WILD. 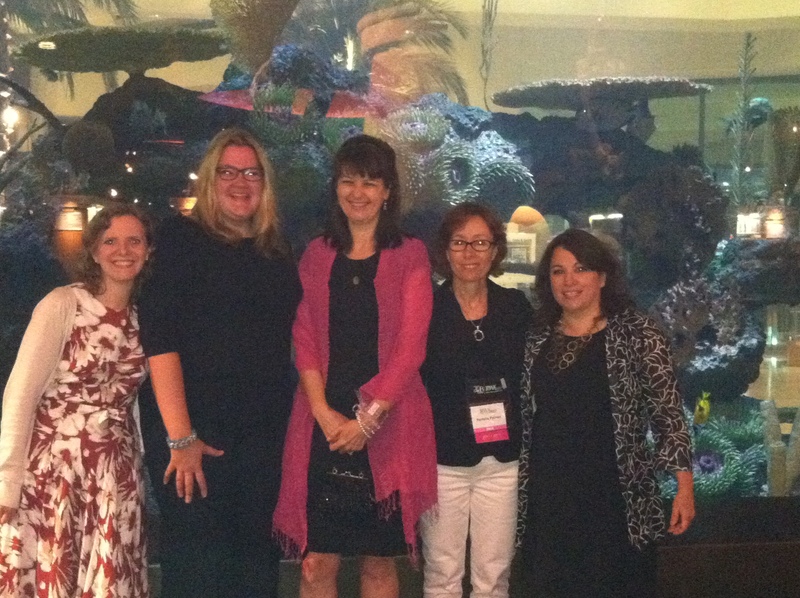 The other fab authors in the anthology: Kerrelyn Sparks, Amanda Arista, and Kim Falconer. It’s already available for pre-order! And not to tease too much, but be sure to look for my newsletter November 6th. (If you don’t receive them, sign up here.) I’ll be announcing a couple of fun little treats for the Feral fans leading up to the Dec. 26th release of book 7 in the series, A LOVE UNTAMED. Now for the Amazing Halloween Giveaway. Want a chance to win 24…yes, 24!…books from Harper Collins paranormal and fantasy authors? 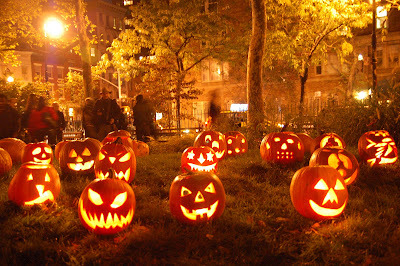 We Supernatural Underground authors are offering up this tasty Halloween Treat. To enter visit: Supernatural Underground Halloween Giveaway and fill out the Rafflecopter at the bottom for a chance to win. Open internationally. Contest begins October 10 and ends October 31. Winner will be announced on November 1. Whether or not you win, may the Great Pumpkin bring you lots of fun Halloween Treats! 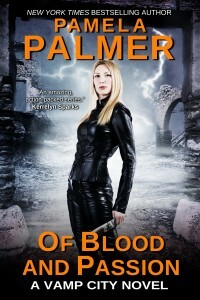 This entry was posted in The Writing Life, Events, Giveaways on October 12, 2012 by Pamela Palmer. I’m home from Anaheim and, six days later, finally firmly back on east coast time. What a blast, though! Southern California has the most gorgeous weather. The Anaheim Marriott, where the convention took place, was practically within walking distance of Disneyland, and while I never quite got to Disneyland, I did sneak away one evening with my roommate and critique partner, Laurin Wittig, for drinks and beignets in Downtown Disney. While days were spent in meetings and workshops, the nights were the most fun. 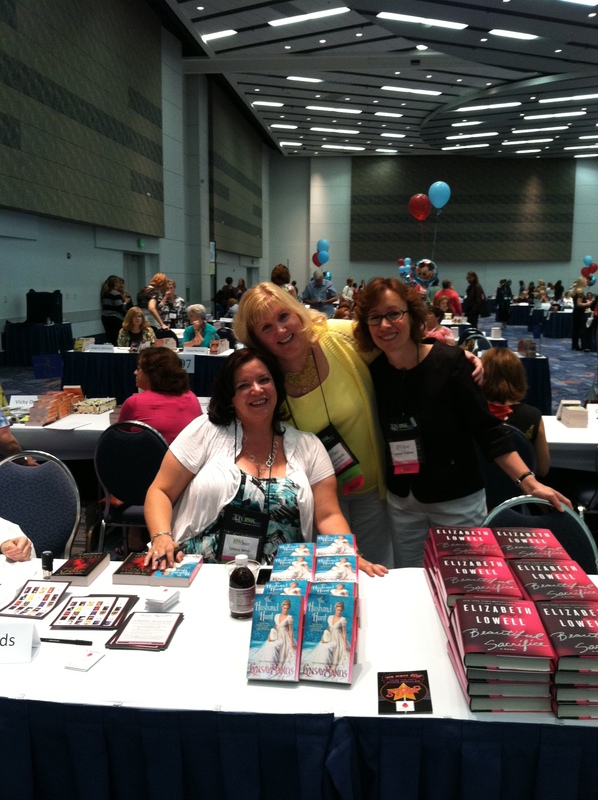 Wednesday night was the Literacy Signing, all proceeds going to charity and over 500 authors signing. Crazy! But always fun. Thursday night, five authors, two Avon editors, and a member of the Avon Books publicity team traveled to the incredible Cerritos Library for a panel, book signing, and a tour of the most incredible library I’ve ever seen. Friday night was the fabulous Avon Party at Maestro’s Beach club in Newport Beach. I’m back home, writing like a fiend before my next trip, New Orleans for Authors After Dark this coming Wednesday. Hope to see some of you there! 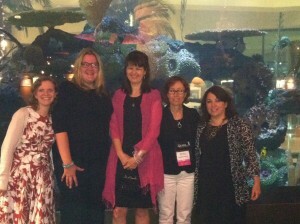 This entry was posted in The Writing Life, Events on August 4, 2012 by Pamela Palmer. Meet Pamela Palmer in Southern Cal! 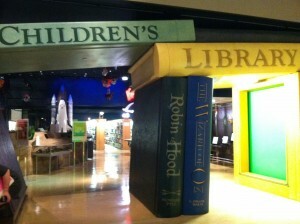 I’ll be at two public book signings this week, the first in Anaheim, the second in Cerritos. Hope to see you! Wednesday, July 25th, 5–8 p.m.
Open to the public. No outside books allowed since the purpose is to raise funds for literacy (though I’m happy to sign autograph books, Kindle covers, t-shirts, etc.). Join me and over 500 other romance authors at the RWA national conference as we sign our latest releases to promote literacy. Join me, Sarah Maclean, Lauren Willig, and Lori Wilde for a moderated author panel and book signing. This entry was posted in Events on July 22, 2012 by Pamela Palmer. Live Chat with me this Saturday! This Saturday, July 7th, I’ll be chatting with readers LIVE from 2-3pm EDT (Washington, D.C. time) at Literal Addiction Paranormal Book Club. In addition to answering your questions about the Ferals, Vamp City, and the Esri, I plan to reveal a few fun teasers from my upcoming Feral Warriors novel, A Love Untamed. AND I’ll be giving away books! I’ll also be posting a blog on Book Monster Reviews on Saturday in conjunction with the Live Chat. So mark your calendars and I’ll see you Saturday! This entry was posted in Events on July 4, 2012 by Pamela Palmer.